Skirrid Fawr - or 'The Holy Mountain'. In the early days of Christianity, with dangers threatening from the Saxon pagan's, a chapel was built on the summit of the Skirrid dedicated to St Michael, the leader of the angelic hosts. Around 800AD, in more settled times, a second church was built in honour of St Michael on lower ground. Nothing remains of this church, however the present church is built on this site. The oldest part of the church is the West end which dates back to the early 12th Century. In recent times a number of major repairs have been made to the Church including the complete restoration of the nave. 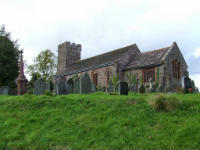 Find out more on Facebook - St Michael's, Llanfihangel Crucorney.